Nini’s Taqueria manager Amy Downing teaches customer Michael Schumann how to make the restaurant’s Southwest fish chowder. Nini’s owner Andy Snow, in back, and Schumann have had a years-long back-and-forth about the secret recipe for the chowder that Snow has perfected in the 32 years since he started making it. About five years ago, Snow promised Schumann he would share the recipe when Schumann turned 50. Michael Schumann, who works at the Durango Post Office, signs a tongue-in-cheek non-disclosure agreement promising to not share Nini’s Taqueria secret recipe for its Southwest fish chowder. 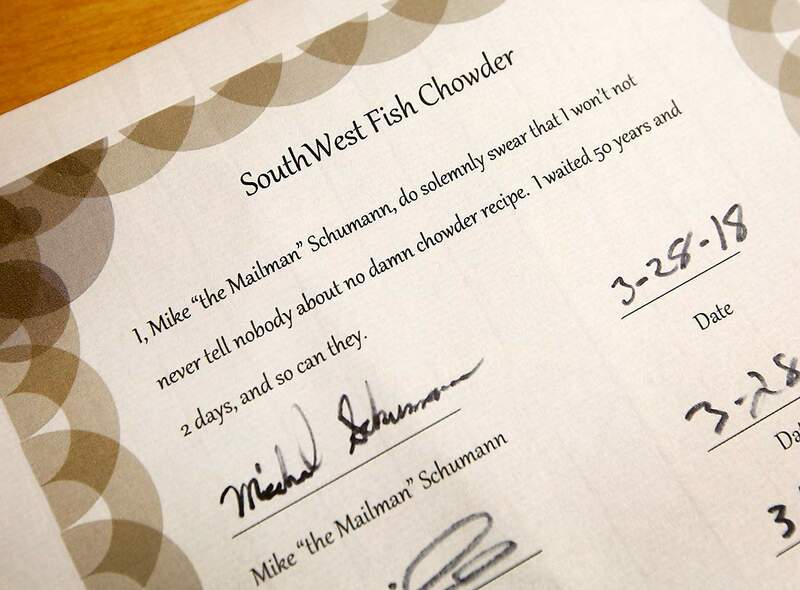 Andy Snow, who owns Nini’s Taqueria with his wife, Abby, created a tongue-in-cheek non-disclosure agreement for customer Michael Schumann to sign before sharing with him their secret recipe for Southwest fish chowder. Andy says customers often ask for the recipe for the chowder, but after more than three decades of tweaking it to his perfection, he refuses. “I created a myth around it. It just happened. It wasn’t purposeful,” Andy said. Charlie Dierkop, far right, has been a fan of the Southwest fish chowder at Nini’s Taqueria for several years. 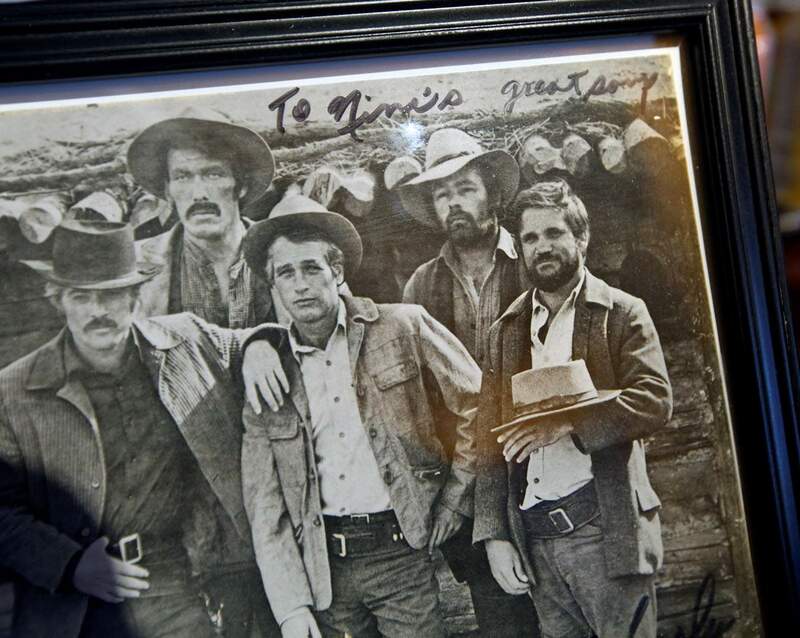 The actor, who has appeared in many Western movies, including “Butch Cassidy and the Sundance Kid” often comes to Durango to attend the Durango Film Festival. A few years ago, he signed a photo of the him with the movie’s cast and gave it to Nini’s owners Andy and Abby Snow. “Great soup,” Dierkop wrote. This is a story about fish chowder, a persistent mailman, a reluctant business owner, a promise, a near death and a nondisclosure agreement. If a crime were involved, we might have ourselves a Perry Mason episode. Instead, we have a tale about the charm of small-town life. HHHSince Nini’s Taqueria opened on Main Avenue in Rio Grande Land in 2002, Michael Schumann, a postal worker, has been a loyal customer. At first, it was the salsas and the burritos that drew him in. Nini’s was on his once-a-week mail route, so it was easy to take his lunch break and grab some fresh Mexican food. Then, Schumann said, about four years ago as he was walking the route on a cold day, he wanted to eat something comforting, something to warm him up. He ordered Nini’s $6 bowl of Southwest fish chowder. “It was the greatest thing I’ve ever tasted in Durango,” he said. And Schumann assures that’s not hyperbole. Immediately, he attempted to replicate the fish chowder at home. Schumann felt confident he’d figure out the ingredients and could eat chowder any time he wasn’t walking Main Avenue to deliver mail. But he couldn’t quite replicate it. It was missing ... something. The next time Schumann went to Nini’s, he told the owners, Andy and Abby Snow, that he tried to make the chowder. Abby would ask what ingredients he used. Michael would tell her, and she’d just shake her head. Sometimes, when Schumann told Andy what ingredient he was adding, Andy would fib and tell him that it wasn’t something he put in his. Or the opposite. “He was on the right path, but even his proportions were off,” Snow said. Andy Snow, owner of Nini’s Taqueria, says customers often ask for the recipe for his Southwest fish chowder, which the restaurant serves only eight months out of the year. Though the recipe is not originally Snow’s, he still does not share it. Schumann and the Snows have a playful relationship. The mailman has not only delivered mail for years to their small restaurant that serves fresh Mexican food, he also has delivered their personal mail at their house, which is on one of his five routes. They see each other frequently, exchange gifts, know about each others’ families. After about six months of trying to make his own Southwest fish chowder, Schumann gave up and asked Andy for his recipe. 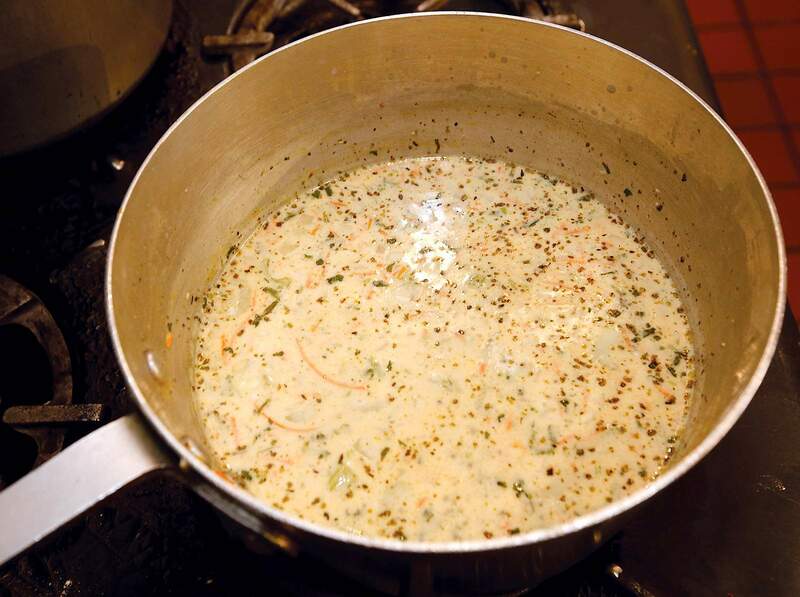 HHHThe Snows moved to Durango in 1996 with a recipe for Southwest fish chowder in tow. Andy said he and Abby found the original recipe in a book about 32 years ago, and over the years, they have tweaked it to their liking. 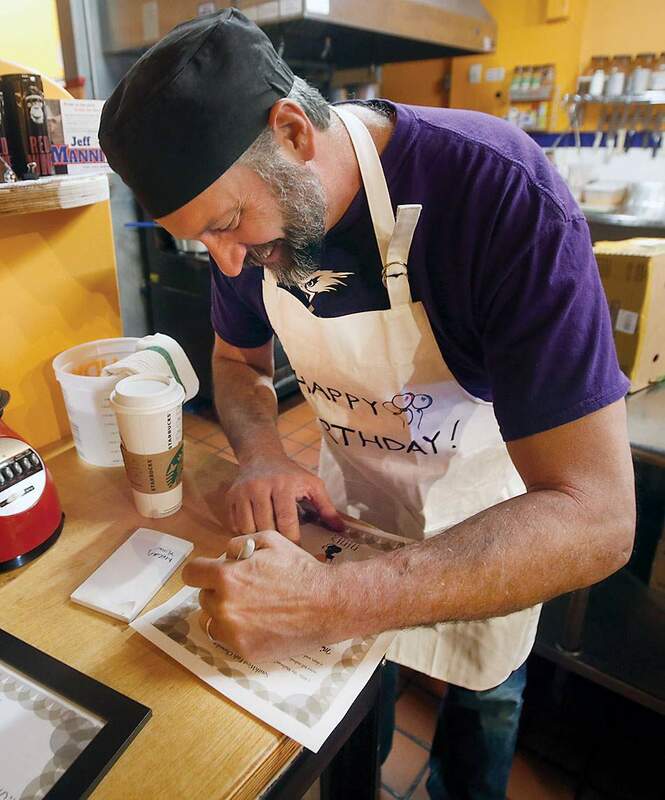 They worked for about three years at Durango Coffee Co., then bought Durango Bagel in 1999. Meanwhile, the chowder recipe sat idle, and Andy wanted to change that. Three years later, the Snows opened Nini’s. “The recipe was what the restaurant was built on,” Andy said. 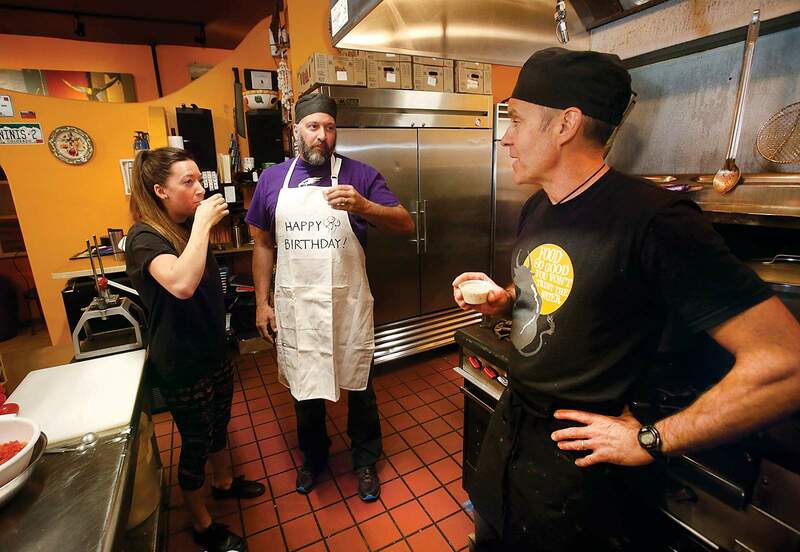 After almost 16 years of being a loyal customer at Nini’s Taqueria, Michael Schumann, a Durango mailman, learns the secret to making the restaurant’s Southwest fish chowder on Thursday with manager Amy Downing. The couple sold Durango Bagel three months after opening Nini’s. They opened Poppy’s, a sandwich place, in 2006 and ran it until they closed it in 2009. But the chowder was served only at Nini’s, and it’s on the menu for only eight months out of the year. “Nobody wants to buy hot soup in the summer,” Andy said. But in those eight months, the chowder is highly popular. Sometimes the cooks must make extra batches in the middle of the day. For years, Andy was the only one at Nini’s who made the chowder; few learned how to make it, and only three now know how. “I created a myth around it. It just happened. It wasn’t purposeful,” Andy said. HHHWhen Andy told Schumann he would not give him the recipe, the persistent mailman didn’t take no for an answer. He asked again. He got the same answer. Repeat, repeat, repeat. Schumann isn’t the only pesky Nini’s customer who has asked Andy for the recipe. “A woman from Phoenix comes to Durango twice a year, and each time she comes in and asks for it,” Andy said. He tells her no, too. Some customers ask Andy why he doesn’t sell it year-round since it’s so popular. After what Andy says was the “umpteenth time” of Schumann asking for the recipe (note: Schumann less dramatically says he asked maybe only a dozen times), the restaurant owner gave in – sort of. Amy Downing, Michael Schumann, center, and Andy Snow taste a fresh batch of Nini’s Taqueria’s Southwest fish chowder on Wednesday morning. Downing, the restaurant’s manager, taught Schumann how to make the chowder after Nini’s owner Andy Snow promised the longtime customer he would share his secret recipe once Schumann turned 50 years old. Andy asked Schumann how old he was. Forty-six, Schumann said. That satisfied Schumann. And it let Andy off the hook for a long time. He said he never really thought beyond that day of the promise, because it was too far off. Schumann, however, thought about it a lot. A year would pass, then another. Then one more. At times he’d stop in for his usual 1:30 p.m. lunch at Nini’s and tell Andy how many days were left until he had to prepare to deliver on his promise. HHHLast spring, as Schumann was walking into work at the Durango Post Office, he had a heart attack. He was rushed to Mercy Regional Medical Center in very serious condition. “They had to zap me,” Schumann said, describing medical efforts to restore his normal heart rhythm. Doctors operated and put a stent in his clogged artery. Schumann said he was unaware his artery was clogged, and he did not previously have heart problems. This is the part of the story where Andy is quick to point out that the Southwest fish chowder was not the cause of Schumann’s clogged artery. The mailman spent three months in cardiac rehabilitation. He spent his recovery time in Michigan, near his family. The mailman filling in for Schumann told the Snows about Schumann’s heart attack. And Schumann told the mailman about Snows’ tasty fish chowder. At the end of summer, right before the chowder reappeared on Nini’s menu, Schumann returned to Durango. He kept the countdown going. On Monday, Schumann turned 50 years old. On Wednesday, Andy shared the secret recipe. HHHOne of Nini’s employees who knows how to make the chowder is Amy Downing, the manager. She’s familiar with Schumann’s love of it. When the restaurant is preparing to stop making the chowder at the end of spring (usually right after the annual Durango Bluegrass Meltdown in April) and there are some ingredients left over, they’ll freeze some just for Schumann. “He gets a grace period,” Downing said. On Wednesday morning, before Nini’s opened for the day, the Snows invited Schumann to their kitchen to learn how to make Southwest fish chowder. 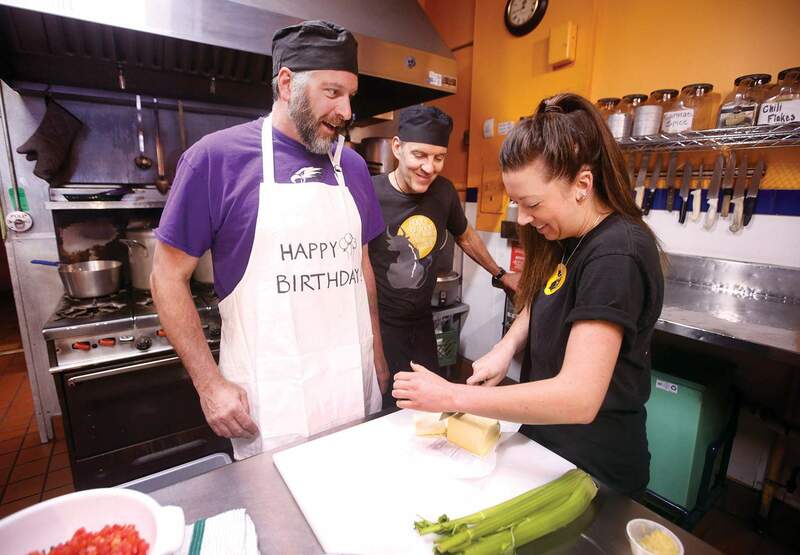 When he arrived, they gave him an apron with “Happy Birthday” on it. There was some laughing and ribbing, especially about how Andy almost escaped having to share the secret recipe. Schumann signed (as did two Durango Herald reporters and a photographer) and then joined Downing in learning the recipe. (The Snows modified the recipe a couple of years ago to make it gluten-free.) Almost immediately, he discovered two ingredients he did not know were in the chowder. Judging by Schumann’s surprised reaction, they must have been simple ones (see non-disclosure part above). The Snows also gave Schumann the recipe in a frame. (The Herald was not shown the recipe, by the way.) Schumann said he’d hang it in his kitchen. Now that Schumann knows how to make the chowder, will he come back to Nini’s? “Of course, I have to,” he said. That’s partly because next week the Main Avenue mail route will be his daily route instead of weekly, and partly because Schumann loves the send-off Andy often gives customers when they are walking out the door. “I have developed a bit of a habit of telling people, ‘let’s be careful out there,’” Andy said, referring to the well-known line Sgt. Phil Esterhaus would say on the ’80s TV police show “Hill Street Blues” after morning roll call. Schumann won’t leave Nini’s until he hears Andy say that.